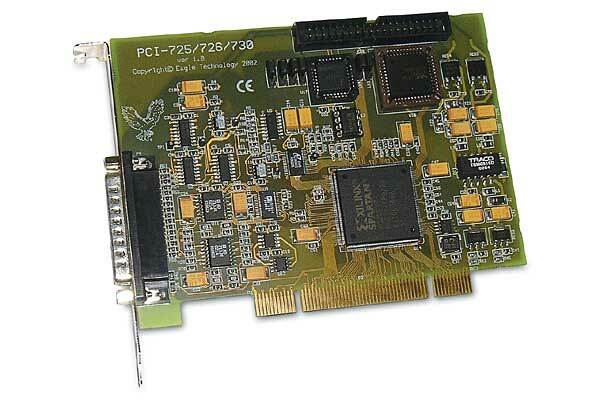 The PCI-730/26/25 is a low cost yet high performance data acquisition board for the PCI-bus. They are multi-function I/O boards and feature both analog and digital I/O on the same board. Designed with university students in mind, the board features industry standard low cost connectors. This makes for easy connectivity, as the user does not have to purchase expensive SCSI cables or connectors. Extremely compact, the PCI-730/26/25 features 16 single-ended or 8 differential 14-bit analog input channels with an overall sampling speed of 100KHz. Compared to other data acquisition boards, our board features four 14-bit analog output channels instead of the industry standard two. These are perfect for labarotary use as voltage references. Typical applications include analog input streaming, voltage measurements, voltage reference outputs, analog & digital data logging, digital I/O for control of relays, frequency counter for event logging & much more. Included with the PCI-730/26/25 is our free data acquisition package, WaveView for Windows which allows the user to start sampling as soon as the card is plugged in.